Premium deformation resistant high-density hard plywood, high-standard surface treatment processes. Molded by die-casting with high-strength aluminum alloy. Stain and discoloration resistant premium fabric. High-strength fiber plastic writing pad die-casted with high-strength aluminum alloy rotating mechanism. About 10 to 15 days. 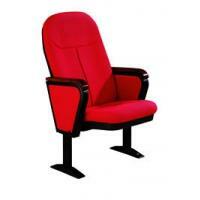 Auditorium furniture, Theater furniture, School furniture, Airport furniture etc.